The head of the Jesuits, known as the Black Pope, Peter-Hans Kolvenbach, pictured here with Pope Benedict XVI, will be replaced for the first time in 25 years. All the incense and intrigue of another papal conclave is upon us again. Well, sort of. Pope Benedict XVI is alive and well and attending to his mission as absolute ruler of the Roman Catholic Church for the foreseeable future. But just down the block from St. Peter's Square, church elders  though not all so old, and without a Cardinal among them  have begun gathering for a closed-door meeting to elect the man dubbed the "black pope." That's the moniker historically assigned to the leader of the Jesuit order: for the color of the simple priestly vestments he keeps on wearing, for his lifetime posting, and for the planetary influence he carries. The Jesuits' outgoing Superior General is a soft-spoken Netherlands native named Father Peter-Hans Kolvenbach, who has served since 1983. The 79-year-old last year became the first ever Jesuit leader to ask for, and receive, papal permission to retire from the post. 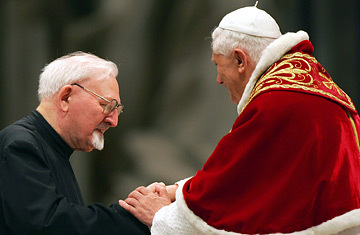 White-haired and goateed, Kolvenbach has kept a low public profile during his quarter-century reign, but is widely praised for his skills in reestablishing good ties with the Holy See after the run-ins with top Vatican officials of his predecessor, a charismatic Basque-born progressive named Pedro Arrupe. Though more recently established, more traditionalist movements and religious orders such as Opus Dei and the Legionaries of Christ have gotten more attention of late, the Jesuits are still far and away the largest clerical order in the Church. They too, however, have suffered from declining ordinations, down to fewer than 20,000 members from a peak of 36,000 in the 1960s. The election for the latest successor of St. Ignatius, the 16th century founder of the Jesuits, will take place in the days following next Monday's opening of the 35th General Congregation, a meeting of 226 delegates elected from the orders geographical "provinces" around the world. Though there is no set date for the election, which requires a three-fourths majority of delegates, Jesuit sources say by mid-January there should be a new Superior General. Though without the absolute lockdown secrecy of the papal conclave  or the accompanying media speculation  the Superior General's election has its own traditions. And intrigue. The voting begins only after four days of what in Latin is called "murmuratio" or private discussions among the delegates about necessary requisites and possible candidates for the job. Anyone showing any sign of ambition is automatically disqualified. Then, after a prayer to the Holy Spirit and oath of allegiance, the voting is carried out with secret written ballots. Like the Cardinal electors in a papal conclave, the Jesuit delegates will be considering candidates' prayerfulness, leadership and organizational capacity, language skills and geography. Some wonder if the Jesuits may elect their first ever leader from Asia, with Father Lisbert D'Sousa of India mentioned. Australian Father Mark Raper, former head of the Jesuit Refugee Service, is also among those on insiders' lists, as is Italian Father Federico Lombardi, the current papal spokesman and longtime head of Vatican radio and television channels. New Jersey-born, Rome-based Jesuit, Father Keith Pecklers, says the ideal successor "will be a combination of the two" most recent superior generals. "We need someone with Arrupe's prophetic vision and courage but also it's absolutely key the leader will be someone with the diplomatic skills Kolvenbach has to maintain close ties with Holy See." Indeed, the order was founded with a special mission to directly serve the Pontiff, and has been dubbed the "Pope's cavalry," engendering suspicion in the past of conspiracies and secret powers. Even Popes, including John Paul II, have criticized them for their apparent autonomy. "Yes, we are in the vanguard of the Church," says Jose de Vera, head spokesman for the order. "It is not our job to just repeat the catechism, but to do research. Sometimes looking for real truth, you can step over the line." Just last year, the Vatican's doctrinal office issued a "Notification" to Spanish Jesuit scholar Jon Sobrino, a proponent of Marxist-inspired liberation theology, for what they called "erroneous ... and even dangerous" writings. Most Jesuits steer clear of offending the Vatican hierarchy, focusing on frontline missionary work amongst the poor and oppressed. Noted in particular for their vast network of schools and universities, the Jesuits are widely considered the day-to-day educational and intellectual motor for Roman Catholicism. Pecklers, who teaches liturgy at the Gregorian University in Rome, has lately been working on an education project in the hinterlands of Mongolia. "Whereas a Benedictine is centered around his monastery, the Jesuit's life is the road. The way we've achieved our credibility is getting our hands dirty, getting involved in issues of countries." Still, the order is facing many of the same challenges that face the entire Church, including declining numbers of clergy, especially in Western Europe and North America, and the tricky balancing act between faith and politics. Since the Second Vatican Council, many Jesuits have favored progressive reform in the Church, seeking to adapt Catholic traditions to modern life. Kolvenbach's request to Benedict to step down as he approached the age of 80, Vatican sources say, could have implications for the "white" papacy as well if a Pope were to consider retiring because of old age or ill health. For now, though, there's just one "papal" transition to worry about. The delegates will do their voting inside the Jesuits' vast, marble-lined headquarters on Borgo Santo Spirito. Doors closed, no outsiders allowed in. When one man has received the necessary majority, rather than white smoke, we'll know there is a new "black pope" by the sound of applause through the wooden doors of the Jesuit sala. As for revealing the new Superior General's identity to the world: before the delegates are allowed to leave the voting hall, a lone messenger will take the short walk over to St. Peter's Square to be sure that, by tradition, the first person to know the name of the new Jesuit leader is the one and only real Pope.